Israel's U.N. Ambassador Dan Gillerman told the Security Council on Thursday that "we heard news" earlier in the day that Tehran bribed Hamas leader Khaled Mashaal "to sabotage the negotiations on the release of Cpl. 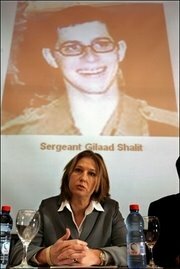 Gilad Shalit and prevent his release." Gillerman later refused to divulge the basis of the allegation or provide details, saying only that "we have every reason to believe that the Iranian regime has bribed Khaled Mashaal."